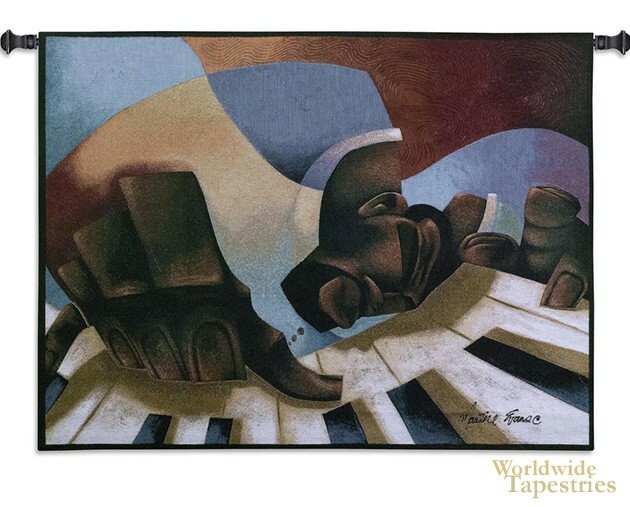 This tapestry 'Frankie Fingertips' is based on the iconic artwork of artist Maurice Evans. This piece is stunning and has the hallmarks of a vintage Evans piece. The abstract rendition, the exaggeration of body proportions and the superb use of color evokes the mood of jazz. His series of works 'The Colour of Jazz' is heavily influenced by music and his works are well known in the world of African American art. Beginning with commercial art and medical illustration, Evans found that these forms of art were too restricting, leading him on his own breakthrough to become a highly acclaimed independent artist in his own right. This stunning, vibrant piece of Evans in the jazz series adds a sense of color, liveliness and contemporary style to any room or home. Note: tapestry rod and tassels, where pictured, are purchased separately.